What happens in the last days before an apartment building's construction is completed? 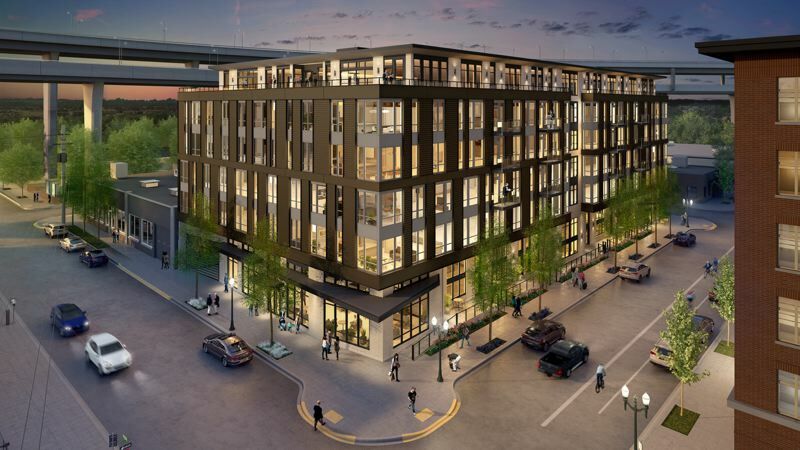 The Broadstone Reveal is a typical apartment building going up in Portland right now. It's a five-over-one, meaning the first floor is concrete, the five above it are "stick built" or made of wood. The wooden framing went up, then the steel studs The bathtubs were craned in, the windows were placed, and the siding and bricks laid. The crane was dismantled. The lights came on, silver fridges appeared in the units and ceiling fans started turning 24/7. The new sidewalk was opened, trees were planted and streetlights came on. And last week a big LED sign: REVEAL. But construction is not over until the last paper is removed from the carpets and inspectors have "wet-signed" the papers. Only then do the pickup trucks vanish and the leasing team bring the balloons and the cappuccino machine. For the Reveal, the job of getting the building ready for a its TCO (Temporary Certificate of Occupancy) falls to Scott Howell, an affable Canadian who is the project superintendent. 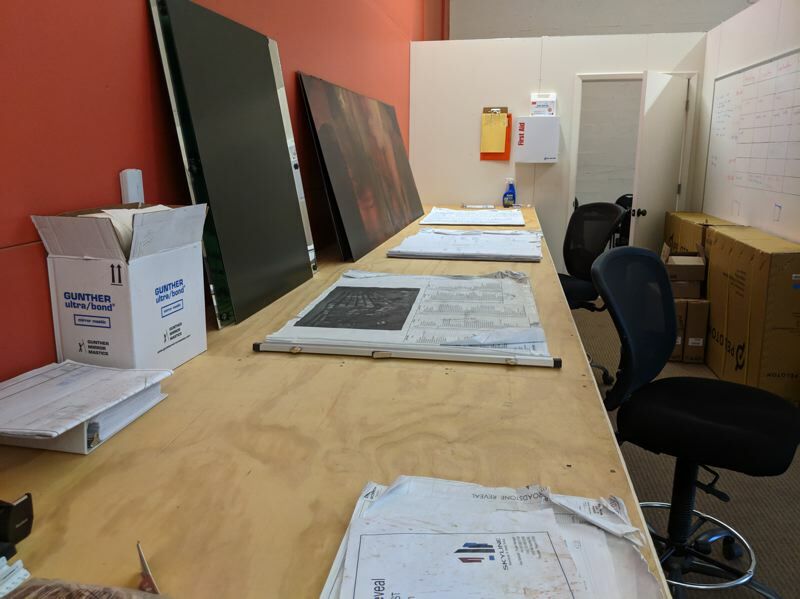 His office, in an empty storefront next door, is one step up from a trailer: sheetrocked together and with rough surfaces for paper construction documents and binders full of notes. There are coats on hooks, coffee, bags of earplugs, a printer and a few computers. On a recent Wednesday morning Howell was in his office doing what he does a lot these days, persuading people to finish their jobs. "How do you (mess) up a doorknob?" he asks someone on the phone. Every minute he gets an email ping, a walkie-talking chirp or a text bing-bong. Heavy rain two winters ago left the hole under six feet of water and the weeks-long delay ate up all of his buffer time. More rain last winter delayed putting the roof on by two weeks. "They (the subcontractors) bid eight projects in a year, they sequence the work so they're busy, my schedule slips, another project's (schedule) doesn't and all of a sudden they're doing four jobs at once. So we're in a real pickle," Howell says. "For most of these trades there just aren't the qualified people." The skilled labor shortage is visible all over the city, as subs run from job to job. Then when they have to be called back to fix something days before a building is to be finished, it gets really crazy. "Stacking people in, I don't like it, but it's what we've got. When you've got multiple people working in units ... I've got guys doing the backsplash, electricians and plumbers trying to trim out, the countertop guy, trim and paint...five trades all on one room, it's a Charlie Foxtrot," he says, putting it mildly. And what classy backsplashes they are: narrow white tile that goes with the dark granite countertops and dark wood floors. Apartments in the Reveal rent for $2,265 a month for a one bedroom/one bathroom up to a two bedroom/two bathroom for $3,490. The floor layouts are named after movie stars: Monroe, Hayworth, Davis, Garland....you get the picture. They're finishing at a canter. Last week on a tour, on the penthouse level (sixth floor) the community room had a bench that hasn't been built or upholstered, counters without countertops, wires dangling where the speakers will go. The stove's hood has yet to come, but the pendant lamps are in place and working. The wood floor is dusty, but Howell says it just needs a wash. Same with the windows. The plastic comes off just before the window-washing crew scales the building. Everywhere there are colored stickers marking things that must be fixed, such as paint scuffs and drywall dents. Howell doesn't have time to do all this — he is usually immersed in Procore, the cloud-based construction management software. Procore lets designer, engineers, general contractors and subcontractors (or at least their foremen) share documents and record their progress. On his computer he pulls up the punch list part of the program. He calls it a deficiency list — things missing or damaged. Each item has a number, a name "for example "countertop missing or damaged," a digital photo, the apartment number, and the name of the person who has to fix it and by when. They're supposed to sign off on it and add a final picture. "Getting people to follow the process is the next part of the trick," he says ruefully. "Then we have to go and verify by looking at it." His colleagues, assistant superintendent Trevor Kauffman and labor/go-to guy Tyler Feeny, roam the halls with their iPads doing a lot of that work. Every company has their own approach to fixing punch list items and who pays. "Our approach has been each sub goes in the units and does their own. The painter and drywaller might work an agreed upon percentage, 25 percent their time, 75 percent fixing what's known as trade damage." The latter is Howell's responsibility and comes out of the budget of Alliance, the project owner. "(Imagine) when the sparky put the cover plates on but the drywaller cut too big around the box? So they (drywallers and painters) have to come and fill in. Or their texture is showing heavy on one spot, that's their deficiency, that's what they have to fix. But some dip - - -t running into a wall, that's trade damage and I'm on the hook for that." Howell likes Procore because it keeps everyone on the same page. If someone cuts through a wall and installs pipe because they are working off an old plan, it has to be all ripped out, sometimes up to all six floors. "Which is expensive and time consuming. Money's one thing, you can always find money, but I can't find time." 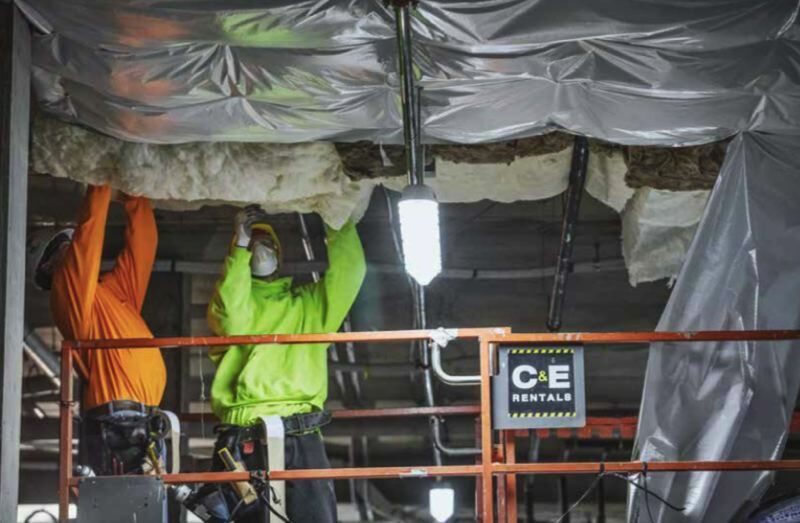 The labor shortage showed in another way too: both the superintendent and the project manager on the Reveal left during the process, so as assistant, Howell had to take over, and Ian Moore, the project engineer, added project manager to his role. That's a lot of pressure. "I call it promotion by attrition," jokes Howell. One thing that helps is that Alliance is an owner-builder: it is the general contractor and it will own, lease and manage the building. "It's nice because we don't have GC-owner arguments. We're all the same team, there's not that building versus operations clash. We meet regularly and get things done." The building is buzzing with workers on their phones. 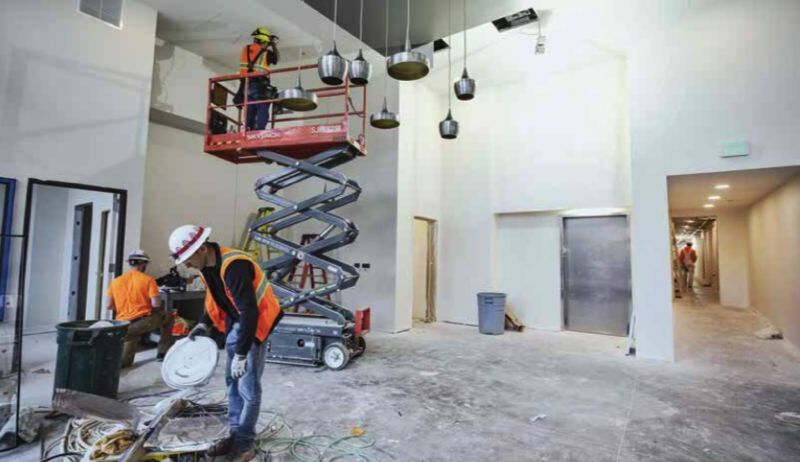 It's not clear if they're checking punch lists or ESPN, but it's Howell and his team's jobs to make sure they are getting close to the Temporary Certificate of Occupancy. He has to get the backup generator online and certified, which is a huge paperwork job. Fire life safety is the main concern. For example, the fire dampers in the duct work. These are little flaps that drop down and prevent fire or smoke from spreading between occupied spaces through the forced air system. Have they got work lined up? After this Howell and his team are moving across to Alliance's two Burnside and Sandy projects. "The development guys always have stuff on the go, we've heard rumors of projects." The younger guys trade stories of how Portland is busier than Seattle, of counting cranes and possibly heading to other states for work for the experience. Asked about a possible slowdown in work, Howell says it's not if but when. "In construction you always worry about a slowdown, it's eventual." Now aged 39, says he grew up on an oil patch in Alberta Canada. "When it's up (the price of oil) you make a bunch of money and stuff it in the bank. Then you went back farming when it went low." "Some guys blow all the money on all the cool toys, but my wife and I made conscious decision to live below our means. I'm ready for it. I grew up poor so I'm conservative with my money." As for salary, the younger guys haven't seen any upward pressure. Howell says they negotiated bonuses when drywall is finished, framing and at TCO. He's been at companies where everyone got stiffed. They were laid off just before TCO so they didn't have to pay the bonuses, but he's confident this time. "Kudos to Alliance, they're not liars," he says. In a hot construction market like Portland in 2018, that's high praise indeed. 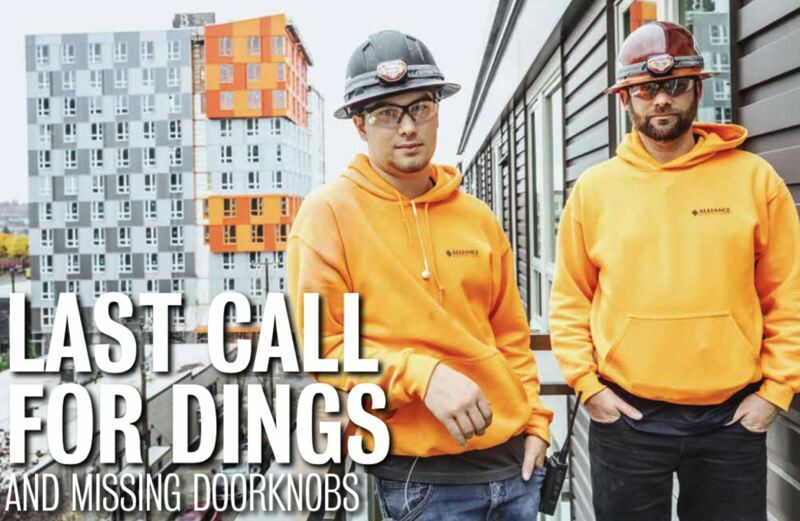 The Business Tribune covered the progress of Broadstone Reveal in cold weather, in hot weather, and looked at the life of young workers who had chosen to enter construction. The building's construction is set to be finished the day before Thanksgiving, and renters could be in by Christmas. The Reveal revealed its name recently with a large electronic sign at street level. 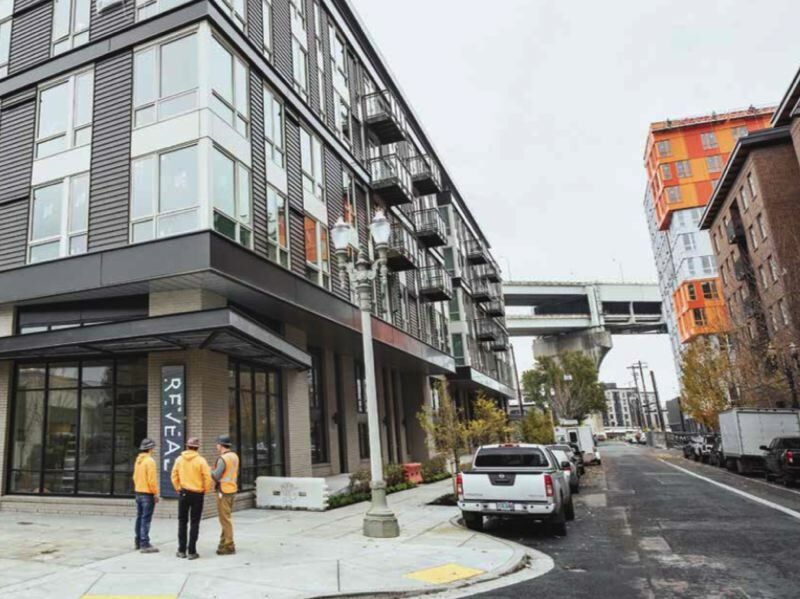 Two other Broadstone apartment buildings being built across the river at East Burnside and Sandy Boulevard are the Broadstone Anthem and the Broadstone Tempo, which was called the Cadence until they found out there already was a Cadence.